Our Heavy Duty T-Grid Display Rack offers versatility and dependability when it comes to grid wall display fixtures. 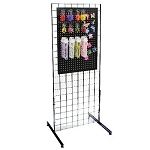 This wire retail display stand has one-inch rectangular style tube framing on three inch grid panels to add extra support for day to day use, durability and peace of mind knowing your merchandise is still standing. Keep your grid-wall merchandiser stationary with the easy lockable E-Z style casters that are included with the purchase of this floor fixture or unlock and rearrange in other departments of your store filled with fun living impulse materials. Our wire grid wall is easy to assemble, includes all the hardware, plus you're saving money because this heavy duty rack ships un-assembled and knocked down. 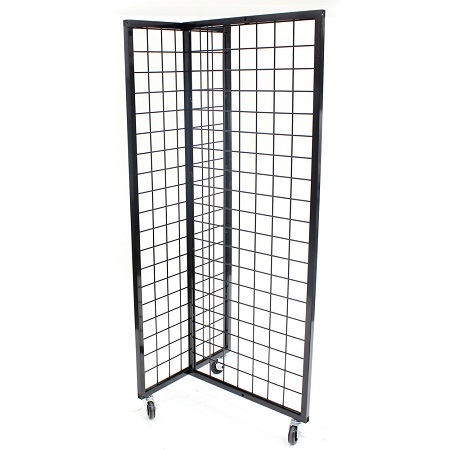 Purchase your metal grid display rack today at Candy Concepts Inc.